In this sequel to OF POSEIDON, Emma has just learned that her mother is a long-lost Poseidon princess, and now struggles with an identity crisis: As a Half-Breed, she’s a freak in the human world and an abomination in the Syrena realm below. Syrena law states that all Half- Breeds should be put to death. As if that’s not bad enough, her mother’s reappearance among the Syrena turns the two kingdoms—Poseidon and Triton—against one another. Which leaves Emma with a decision to make: Should she comply with Galen’s request to keep herself safe and just hope for the best? Or should she risk it all and reveal herself—and her Gift—to save a people she’s never known? If you haven't read book one of The Syrena Legacy, "Of Poseidon", then I wouldn't advise reading this review as their could be minor spoilers. If you missed my review of book one, you can read it here. Anna Banks has proven with her second instalment of The Syrena Legacy that this is a series I devour. From book one the series stood out to me and was one that I really enjoyed and thank heavens the sequel was not a disapointment. Of Triton kicks off pretty much exactly where Of Poseidon left off which definitely worked in her favour. I mean, it would just be plain cruel to make us wait even longer after the cliffhanger at the end of Of Poseidon. The beginning was action packed which was great because we all had to decide whether we loved or hated Nalia and needed to get to the Emma and Galen scenes pronto. 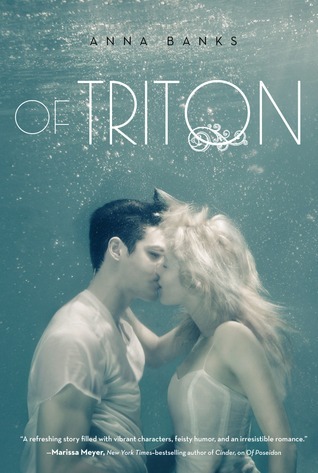 There is something about this series that is just so refreshing and Of Triton was no different. And I think those that have read book one or two will admit that one of the best things about it is Galen. Galen is attractive, protective and oh so dreamy. He is just the perfect match for our feisty and brave female lead, Emma. They are one of my favourite couples and their scenes were most definitely the best of the novel. As you can probably tell I am a strong shipper of there relationship and saying that I wish their had been more scenes between them and that they were a little bit more lighthearted. But the scenes that we did get were very satisfactory and swoon-worthy even if it was put on a bit of a hold. Of Triton focuses more on the political aspects of things which I think is quite appropriate for the whole law factor in the novel. Since we are dealing with Mermaids *cough* Syrena and all of their history and rules then it was bound to happen in one of the novels and it was done in a really interesting and entertaining way. Because it did focus on a more serious side of things rather then book one, there was less humour. One of the things I loved about Of Poseidon were the loveable, witty and fierce characters and all of the laugh out loud moments. Believe me when I say that I was laughing at some of the things said and a big percentage of that award-winning humour was there, but I just would have loved to see more. There were certain plot twists in the novel that were quite cool and sometimes shocking but cleverly thought out. I think the Gift thing was focused on brilliantly and a particular scene was quite awesome. But one thing that surprised me about Of Triton was that I found myself quite confused by the whole POV change. I mean I love that we get to read from both Galen and Emma's perspective and it was written no different from book one but it just confused me. I don't know how or why and maybe it was just because I stayed up quite late whilst reading it and probably didn't have any sense left in me but it did. I'm quite used to dual POV by now and I was completely fine with it in book one but this time I had to search for who exactly was narrating. Overall I find it very hard to fault this series because it's one that just clicks with me and my likings. I'm the type of person who enjoys fluffy stories, mermaids, action and top notch romances so it was obviously one that I LOVED. There were some little things that irked me but they certainly weren't 'OMG, I can't read this anymore" material, and to be honest I did not want Of Triton to end and already the wait for book 3 is killing me. I loved Of Poseidon and for some reason decided to put off reading Of Triton but now your review makes me excited to read it again! Strange about the POV issue, it makes me wonder if maybe their voices have become too similar to tell apart. Great review! Sounds like a good book! I'll have to keep an eye out for it. Thanks for sharing this review! I haven't read the first yet, but it sounds like its worthy! I'm glad you enjoyed this one - this series has always intrigued me! I may need to pick book one up sometime (don't worry, only read concluding paragraph of your review! ;P)! If this book made you laugh out loud then I need to get started on this series! I hardly ever actually laugh out loud when reading a book so this must be truly incredible. Squeeeeeee! This series is one of those that I'm waiting to finish so I can start :D Have to admit that I skimmed your review so I didn't get any spoilers but I'm sure it's fabulous! GREAT REVIEW, I have had this book on my shelve for such a long time but never got the chance to bring myself to read it.